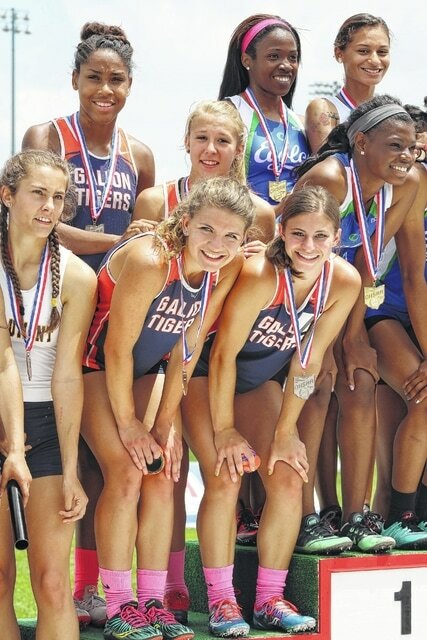 Galion placed second in the girls 4×100-meter relay at the 2015 OHSAA track and field championships, posting a time of 48.94 seconds in the finals on Saturday at Jesse Owens Memorial Stadium in Columbus. The team features (back row, from left) Alasha Williams and Sydney Hunt, (front row, from left) Michaela Slone and Clair Erlsten. COLUMBUS — Galion girls relay team members stood on the podium twice Saturday at Jesse Owens Memorial Stadium in Columbus. While they may have not have been in the exact order they hoped to be when the meet began, the Lady Tigers still capped off a tremendous season with OHSAA track and field medals hanging around their necks. Galion was the Div. II state runner-up in the 4×100-meter relay and finished eighth in the 4×200-meter relay. The team of seniors Clair Erlsten and Michaela Slone and juniors Sydney Hunt and Alasha Williams posted a time of 48.94 seconds in the 4×100 finals on Saturday, matching the time they recorded in Friday’s semifinals. Dayton Chaminade-Julienne, seeded second behind Galion for the finals, won the state championship after finishing in 48.7 seconds. C-J posted a time of 48.96 seconds in the prelminaries. Erlsten battled through injury most of the season and was thankful to have the opportunity to run at Jesse Owens Memorial Stadium one final time in Galion orange and blue. Slone said she was pleased with the state meet results considering the obstacles the Galion relay squads have overcome this season. Despite a rough hand-off on the first baton exchange, the Lady Tigers were able to rebound. Erlsten was just a step behind C-J’s Deja Gilliam at the finish line. Erlsten, Slone and Williams teamed with junior M’Lynn Gwinner in the 4×200 relay. Galion finished in eighth place with a time of 1:45.72. The Lady Tigers were the sixth seed entering the finals after recording a time of 1:44.53 on Friday. Hunt and freshman teammate Marisa Gwinner competed in the long jump on Saturday. Neither athlete was able to move beyond the first round after each recorded three fouls. Erlsten and Slone missed Galion’s commencement ceremony on Friday due to competing at the state meet. They were presented with their diplomas in the podium area following the 4×100 medal ceremony on Saturday at Jesse Owens Memorial Stadium. Kyle Baughn, who is the incoming assistant principal and athletic director at GHS, presented the diplomas to Erlsten and Slone.